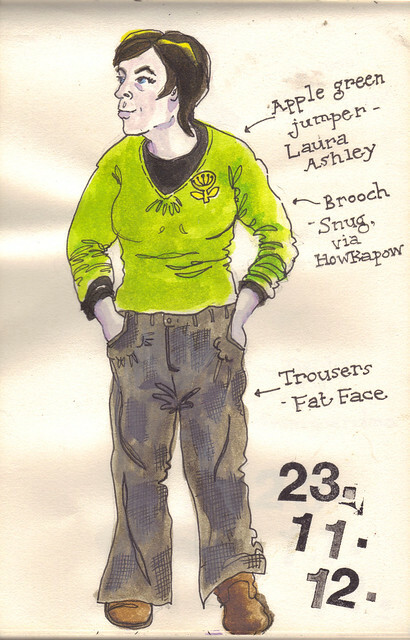 Bleurgh, can you tell I wasn't enjoying drawing these today? I forgot about these trousers until I was looking for smart clothes to wear to my meeting on Wednesday - they were hanging with two other pairs of trousers in the midst of the wardrobe - so apologies for any musty smell to sleepygoldfish, whom I met for a sandwich at lunch time today. Mind you, we sat in a basement of a cafe in Hanover, so, you know, who's going to notice a little more mustiness. Not only had I forgotten these trousers, but I'd also forgotten their fatal flaw, which is that they're just a little bit too loose. You either have to tread on the hems all day, or bunch your fists into the pockets and hold them up while you walk. I have a feeling they might have originally come with a belt made of the same fabric (minute brown dogtooth check on cotton, that makes me want to call it Harris tweedesque, only without the tweed), but I'm darned if I know where that is, and any other kind of belt is going to look odd. They're from Fat Face - shout out once more for Item's classic joke upon seeing a branch in Dartmouth, "Mummy! I can see a Fat Face... [pause].. and it's yours!". I love the colour and feel of this jumper - it's made of some kind of rough, stringy knit - ah, the label says 59% linen and 41% cotton. 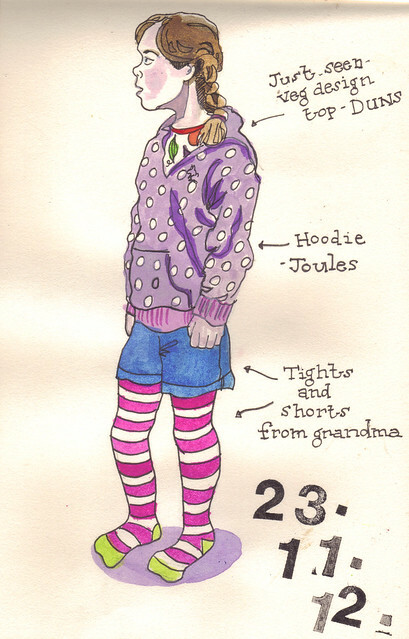 Great tights/shorts combo courtesy of grandma; the spotty Joules hoodie is a frequent standby; underneath it is the top she wore for the PYO farm, the one with lots of veg all over it. She always looks very young in it - but as soon as she put the hoodie over the top, I suddenly felt like she was looking long-legged and coltish.